I am by far the worst person I know for putting too much pressure on myself to get things done perfectly every time. 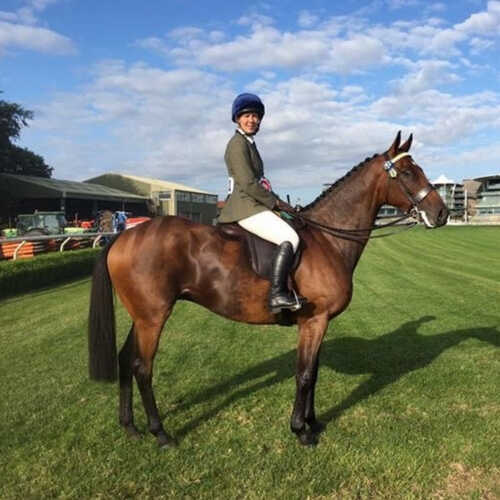 Showing is not something that comes naturally to me, I ride well and effectively but I wouldn’t describe myself as a beautiful, or stylish rider, and of course learning to show former racehorses in Retraining of Racehorse (RoR) classes presents some challenges of its own. I have suffered a couple of confidence knocks recently that left me unsure of my own ability to ride competitively for Mrs P.
Friends decided I was in need of some help (to see how wrong I was and that it was just a wobble) and kindly organised for me to visit showing legend and multiple Horse of the Year Show champion Jayne Ross, who does not live too far from us. She has been doing a great job helping me learn to cope with riding such a good horse to my best ability and to work with another retired horse, Buddy’s quirks rather than fight him. I learn so much from boxing the horses over to Jayne’s once a week to ride in unfamiliar locations than I do continually riding in the comfort zone of my home arena. Also the horses learn that standing on the lorry doesn’t do any harm and that lorry trips don’t always mean we are competing! It is also really important to not overfeed and be in a hurry to change the body shape of retired racehorses. This takes time and patience, lots of hacking and plenty of turnout. Although we all want beautiful shiny and well conditioned horses, they have to be rideable. High fibre, oil based diets work really well for my horses and I am lucky enough to have great support and advice always at then end of the phone from my feed company. There are no short cuts, and hard work always pays off. 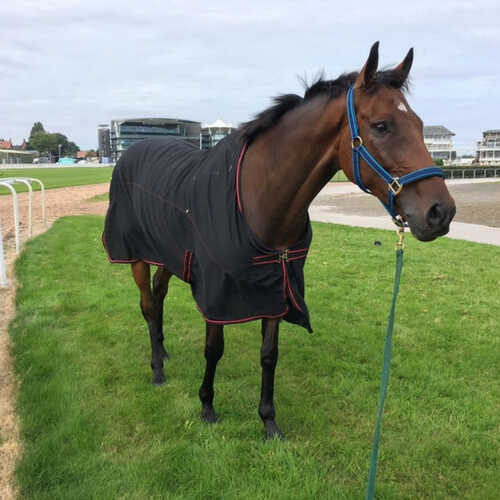 Racehorses are used to being well rugged, and most like to be kept warm so reach for a rug before piling in lots of extra food would be a top tip. A more recent competition at The Royal Berkshire Show showed that despite being an absolute pro even when out out of his comfort zone, (with manners to die for even when he wanted to explode!) Annacotty needs to have a bit of time to chill out and unwind. It is most important I don’t want competition days to be associated with stress. I am looking forward to returning to the same routine I followed with Buddy over the winter — riding club clinics and trips out to do dressage to switch his brain off from racing mode. I have no doubt Annacotty is going to be brilliant and have a lovely second career showing, - and hopefully in the RoR challenge and eventually working hunter sphere, but I have to not let myself get carried away with how effortlessly he does things for me, and ask too much too soon. When we were in the ring, it felt like he was saying to me, “I haven't got a clue what you want me to do, but I'm trying very hard. But where is my race? When are we racing?” For me this means it’s time to back off and slow his training down. It was very disappointing that the Newbury Showground grass was littered with rubbish and glass bottles, proving it to be unsafe to ride around in the open space behind the lorry park, and the warm up arena was simply too small for the racehorses to work in, meaning we all had to look for other places to work in, or like me, went in the ring unprepared! We all had issues with tense horses in the ring as a consequence and the extremely loud overhead tannoys meant I’ll be looking to use ear plugs in the future! This is something I will work on with Jayne’s guidance over the winter. My most invaluable piece of kit this year has to be my Protechmasta rugs. We were lucky enough to trial some earlier in the year, and found them to be brilliant. Every Prowting horse at home now has one as a day rug. I take them everywhere as so useful. They keep horses cool but warm enough, always travel really well in them and I would not be without them when bathing or drying hot horses off after competitions. Despite multiple washes they keep their smart look and dry fast which is vital on a busy yard like mine. I really hope the team at Harry Hall develop a Protechmasta exercise sheet - I would love to have one for riding out in, and can imagine how popular a line that would be. Don’t worry Hannah - we’re on the case! !